Medical Devices Industry is undergoing a strategic change with the focus of the industry moving from diagnosis to prevention. With a growing number of aging population and increasing chronic diseases, innovations in the medical devices that lower hospital readmissions prove to be crucial. In fact, the production of medical devices is projected to rise three percent every year through 2023. Not all medical devices are equal. Few of them could be invasive by nature, so it is imperative for medical device manufacturers to consider the highest-of-standard design and performance characteristics while meeting stiff regulatory requirements. Innovations and technology advancements also play a huge role in the equipment industry that serves healthcare providers. Medical device manufacturers today are using the right materials and additives to increase the strength, flexibility, and customization options for medical devices and surgical instruments. The right materials can improve the performance of the medical device by delivering greater capabilities, higher accuracy, and increased patient comfort. With rapid innovation and advancement happening around, 3D technology is a growing trend poised to transform the ways medical devices are manufactured. The rapid technological developments in home-use devices such as glucose monitors, insulin delivery devices, nebulizers and oxygen concentrators are also creating a positive impact in the industry. The use of remote communication technology to allow healthcare professionals to support home-based patients is further aiding to the preference for home and self-care. The medical device industry is increasingly pivoting toward a design-for-value orientation and much more cross-functional integration of the marketing or commercial functions. Along with the efforts to control costs, manufacturers also aim to significantly shorten and tighten up waste in the supply chain in order to advance manufacturing developments. 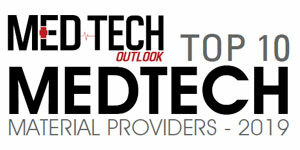 This edition of MedTech Outlook features companies that are at the forefront of offering medical device solutions. In the last few months, a distinguished panel comprising CEOs, CIOs, VCs, and analysts including our editorial board reviewed the top companies in the MedTech domain and shortlisted the ones that are at the helm of tackling challenges in the medical devices industry. The companies compiled in this issue have exhibited extensive business process knowledge, along with in-depth and innovative strategies in the space. We present to you MedTech Outlook’s “Top 10 Medtech Material Providers 2019”.